Homey-app to add Virtual Devices that can trigger your flows. A Virtual Sensor is a bit contradictory, but nevertheless users wanted to view a value in a device, e.g. the actual room temperature in a Thermostat. Simply add one of the sensor-capabilities to a Virtual Device. The value of a sensor can be set with an action-card in a flow. Add the card entitled ‘Set a virtual sensor value’ in the Then-column of a flow. Set the technical name (see below) of the sensor-capability in the first field. Set the value in the second field. This can also be a tag from another device or card. The technical name to fill in step 2 above is the capability name as shown on Athom’s capability reference. It is the name in the grey-box, e.g. 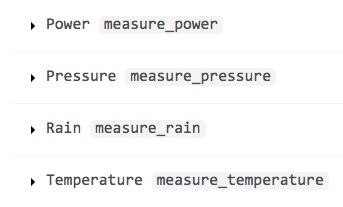 measure_temperature. virtual-devices is maintained by ArjanKranenburg.